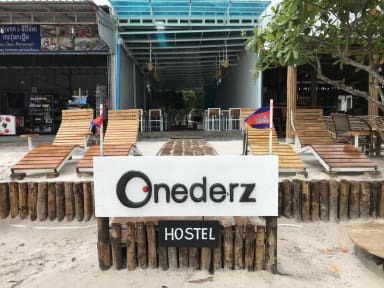 This beach front hostel has a roof top with great view, air conditioned rooms, wifi, comfortable beds and lockers, clean and modern shared bathroom. You will enjoy great sea view and mountain view from our roof top. Breakfast, lunch and dinner are available at our kitchen at reasonable price. As we also have a hostel in Sihanoukville, you will enjoy easy access between 2 hostels! 11. No Smoking inside the rooms. In my opinion, amazing. A non party but anyway friendly hostel. Very clean. 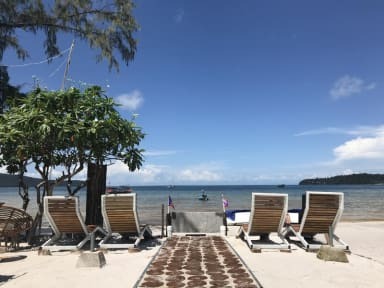 Beautiful peaceful location with white sand beach in front of the hostel. Confortable bed with personal plugs, light, curtain and lockers. Nice bathroom and showers (without hot water but I guess as in many places in the island). Staff very polite and nice. And very importan, in my opinion, the staff is cambodian. I highly recommend it.